EmbToolkit, here, means Embedded systems Toolkit. 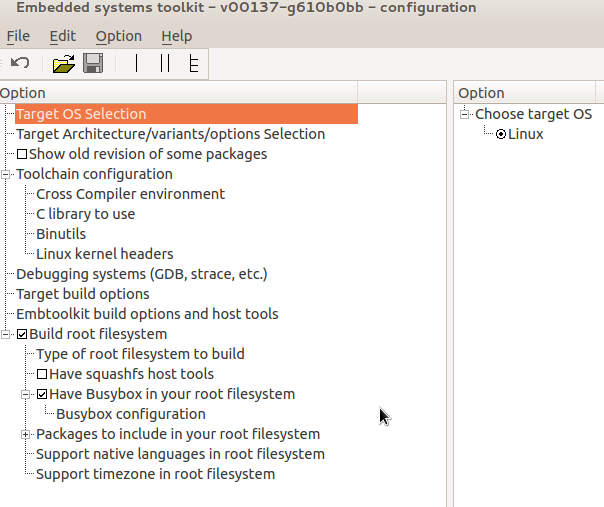 EmbToolkit eases setup of necessary tools for embedded linux system development, including the root filesystem generation. It generates toolchain/SDK based on traditional GNU tools (GCC, Binutils, etc.) and/or the newer clang/llvm compiler infrastructure. EmbToolkit will be handy if you want to develop applications and generate firmware for a highly customized/specialized embedded linux product. First of all, EmbToolkit is designed to be simple to use and to customize. Setup a cross compiler environment based on GCC or clang/llvm or both. Test easily the toolchain usability/quality (by means of the generated nfs root filesystem). Easy configuration interface through menuconfig or xconfig, like the linux kernel. All options of C libraries used (EGLIBC and uClibc) are directly configurable through the main configuration window. You can optionally integrate various packages, from busybox, Gtk+ graphic library, to a complete graphic X window system, among others. You can add your own package and take advantage of EmbToolkit package build system. The build system handles packages dependency, automatic rebuild if configuration and/or dependency changes, etc. Toolchain and packages build are cached, this speeds up the build process (after a first build).